That’s not out of the realm of possibility. I remember road trips being a blast when I was a kid. However, my parents have completely different memories of those same vacations. One of my particular favorites was an impromptu vacation one summer to Colorado with my Aunt Robbie and her three boys in a Winnebago she’d borrowed from a friend. 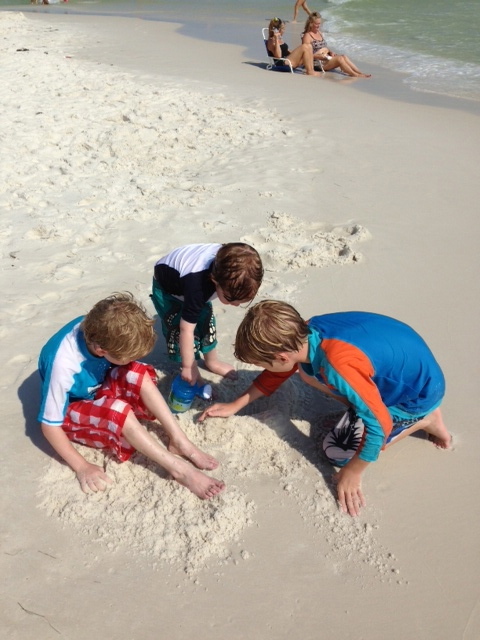 We had so much fun hanging out with our cousins. I saw my first shooting star in Ouray, Colorado. And we all played games, ate junk food from gas stations and laughed our heads off as our parents fretted about whether we’d make it to the top of Pikes Peak in that behemoth vehicle. If I dig deep into my memory, I do remember my dad cursing under his breath and us having to stop at auto parts stores quite often. Anyway, I was finally able to convince Kevin since Seaside, Florida is only a twelve-hour drive with the added bonus of spending a night in New Orleans to break up the driving. 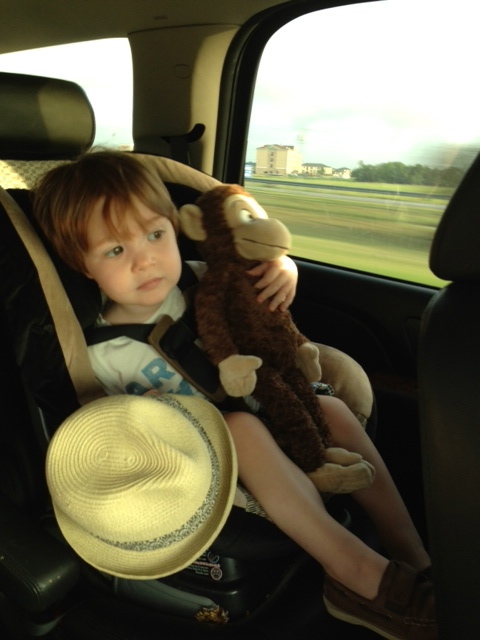 We loaded up the kids and Rowan grabbed his monkey, George, and we were off. We made it to New Orleans in a little under eight hours, checked into our hotel, and set out to explore the French Quarter. Colman was super excited to see the French Quarter. He always buys it when he plays Monopoly and he wasn’t disappointed. 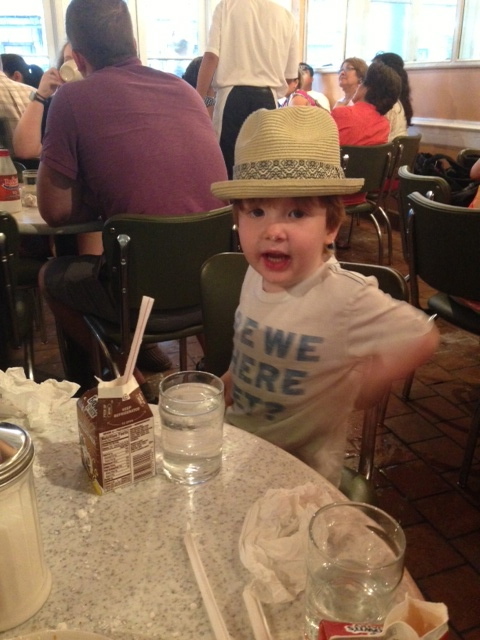 We went to an early dinner and then took the boys to Cafe Du Monde for beignets. They weren’t all that impressed with beignets, but Rowan loved the powdered sugar as evidenced in the picture below. Yes, that’s powdered sugar on the tip of his nose. 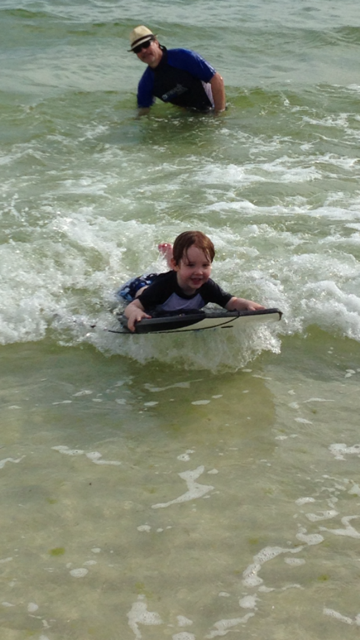 Rowan is a maniac on a body board and in the water in general, which almost caused my heart to stop on several occasions, but I managed to soldier on. I really love raw oysters. Especially the little, tiny, briny ones that you can get here in San Antonio at The Sandbar restaurant. They’re from places like Nova Scotia and Prince Edward Island and they’re delicious. But I said, “Honey, I don’t think that’s such a good idea. Gulf oysters are not in season right now,” which prompted a discussion of how I know they’re not in season. I grew up in South Texas on the Gulf Coast? Kevin didn’t believe me that Texas had alligators either until we went to a birthday party for Judge Henry Schuble at his ranch in McCoy and he saw some with his own eyes. Armadillos carry leprosy. That’s a fact. Kevin finally admitted to that one after we did a google search, but insists you’d probably have to damn-near french kiss one to get it. I disagree. I think you can probably contract leprosy from an armadillo by hitting one with your car. Here’s an interesting fact about how to tell the difference between a king snake and a coral snake. Red touches black, friend of Jack; red touches yellow, kill a fellow. So I dug into my veritable well of weird knowledge and I explained that a good rule of thumb I’d always heard is if there’s not an “R” in the month, then you should probably steer clear. The Gulf is too warm during the summer months for good oysters. In perfect lawyer fashion, Kevin reasoned that the restaurant wouldn’t have them on the menu if they make people sick. Right? I started doubting myself. Maybe that rule only applies to Texas Gulf oysters. Maybe Florida Gulf oysters are different. And these particular oysters were from a region of Florida called Apalachicola Bay and that sounds kind of cold. My credibility might be better, too, if I wasn’t always following up all my warnings to the kids and Kevin with some sort of dire consequence, such as, “Rowan, don’t slam doors. You’re going to lose a finger!” Or, “Colman, do not use the back of the sofa as a balance beam. You’re going to fall and crack your head open like an egg!” Or, “Liam, do not point that BB gun at your brother. You’re going to shoot his eye out!” I do this all the time. I can’t help it. I feel like these boys don’t have the ability to think through what the consequences of their actions are sometimes. I just want them to think. So Kevin ordered the oysters against my advice and gobbled down about eight of the plump, bloated things–I shudder just thinking about them–and woke up the next day really sick. “Why do you automatically assume it was the oysters?” he asked me. Really, I think this is all an unfortunate consequence of Kevin being from Missouri, the Show-Me State. It’s been a tough year with lots of tests, medicine, doctors visits–here and in Houston–and a heart cath, but we’ve avoided lengthy hospital stays and, for that, I’m grateful. Colman has been doing really well the last three weeks and Kevin and I have noticed a surge in his energy. I’m hoping it lasts a while. In light of how good he’s been feeling, we’ve put off the transplant evaluation in Houston for now. We’re going to see an endocrinologist to rule out any sort of growth problem, which nobody thinks he has, and he will be undergoing some tests to check his liver and kidney function. I remember Uncle Gene wasn’t even planning on going, but then we realized nobody else could drive that thing. We had to go to Wal-Mart and buy him underwear. Love you! Glad you guys had fun! We just had the discussion with the kids about when you shouldn’t have oysters. Personally, I don’t think I’ll ever knowingly eat oysters from the Gulf of Mexico. Show Kevin a map of water temperatures around the world in July-August. I’ll bet the Gulf is among the warmest. Sorry Coleman is limited where he can go right now, because you guys are in prime road trip years. It was stressful, but we had some of our best trips with our kids on road trips. And now the technology is so much better with kid-occupying technology! John has great stories about trips in station wagons with his family of 7. They all involve his mom making gin and tonics in the front passenger seat for Jack and herself as they got close to their destination! Great story, Heather! As usual, you had me in stitches!!! Miss you! In New Jersey, we are also taught to avoid eating shellfish in month’s lacking “r” in its name. « The TALK, the BOOK, and the CONSENT.